A NYboL brother, regular at the Eagle, and 2011’s Mid-Atlantic Leather boy, Andy Tonken is the subject of this edition of Beneath the Black Guard–my interview series with members of the leather community. Andy grew up in D.C. and has been in NYC for four years now and was one of the first young men I was introduced to when I entered into the scene. Adorable and clever, dedicated and true, Andy is an inspiration to men and boys alike. I caught up with him one evening before CODE to get the story on this cutie pie leather boy. Which side? (Give me both) Ok, on the right, hunter green, yellow, pale yellow, magenta—from time to time—and then on the left, yellow. Do you have a favorite item of gear? All of the gear that I have means something to me in a specific way and reminds me of either when I got it or the period of my life I was in when I got it…or how it makes me feel when I wear it. When I’m in my boots I feel like I’m on top of the world and they really give me a lot of confidence. I also love my vest that has my NYboL patch on it because it’s a mark of achievement for me to be accepted into NYboL. I love my chaps because they are the first piece of leather that I ever bought and my first pair of boots are special because I stole them from the theater department of my high school…every piece has a story. What drew you to the leather community? I had been intrigued and cautiously checking out the scene for a while. And then I met someone who became my first mentor in leather while on vacation with my mom…it was a great family vacation, let me tell you…and then I just started going out and getting to know people in the community and came out to myself as a leather boy and yeah, here I am. The way I describe NYboL to folks who are unfamiliar with boys’ clubs is as a leather fraternity. NYboL stands for “New York boys of Leather” and we are one of a series of boys clubs that exists across the country and throughout the world. We’re a group of leather people who identify as boys and we work together to serve the community in order to share experiences and learn from each other, and also have fun. NYBboL in particular is a group of self-identified boys, so not all of us are biologically male and we have members of all ages—all over 18, of course. Why did you run for the Mid-Atlantic Leather Boy title? That’s a question I’ve been asked many times in the last few weeks and it’s one the judges asked me in the interview portion of the contest. The answer is, I didn’t need a title to be a leather boy, but having a title certainly facilitates the kind of service and outreach that I’m interested in doing. That includes fundraising and community activism as well as education and mentoring for the other leather boys out there. I want other boys to know that they have a place to feel confident in their identity and that you don’t have to fit a certain mold to be a leather boy. It’s important when you’re young and in the scene to have a place you can go to and get support from other boys. It’s great to learn from our elders, but there’s also something to be said for boys learning from other boys. If I had one wish for my year as a title holder it is to help mentor other boys in the community. 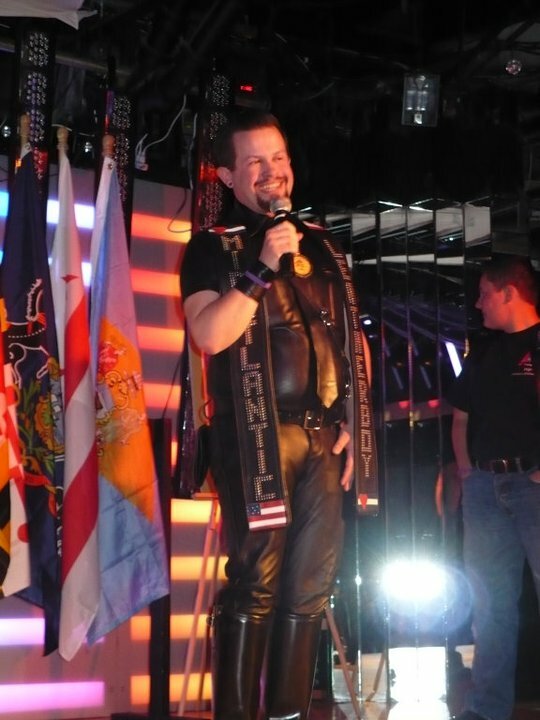 What was your experience at the Mid-Atlantic Leather boy Contest like? The contest started and was over in a blink of an eye. Backstage everything is moving quickly and you have to take little mental snapshots of everything along the way or else you won’t remember anything. The contest was really four contests in one including Mid Atlantic Leather boy, Leather Sir, Leather Woman, and Community Bootblack. I knew another contestant in another category, Morgaine running for Leather Woman, and it was really nice having that kind of relationship and support backstage. She was so helpful and sweet to me and reminded me of why we in the leather community do what it is we do. Winning was really exciting…and shocking. And also terrifying…everything all at once. With a title comes responsibility and now that’s it’s sinking in I’m really excited and looking forward to the coming year. Any words of wisdom to a young person entering into the community? No matter who you are, be who you are…explore who you are, try new things and put yourself out there. Remember from whence the community has come, but also be genuine and bring what you have to offer to the community. Find the role and the place that fits you and go with it. Being yourself is a lot sexier than trying to be someone else. Andy with current Mr. New Jersey Leather, Robert Vitale. Short on stature, big on heart. To learn more about Andy, you can find him at the Eagle on Thursdays at CODE.